Pernik (Bulgarian: Перник) is a city in western Bulgaria (about 20 kilometres (12 miles) south-west of Sofia) with a population of 80,191 as of 2011. Pernik is the most populated city in western Bulgaria after Sofia. It is the main city of Pernik Province and lies on both banks of the Struma River in the Pernik Valley between the Golo Bardo Mountain, Vitosha Mountain, Lyulin and Viskyar mountains. Pernik is the main city of Pernik Province – province in western Bulgaria, neighbouring Serbia. Originally the site of a Thracian fortress founded in the 4th century BC, and later a Roman settlement, Pernik became part of the Bulgarian Empire in the early 9th century as an important fortress. The medieval town was a key Bulgarian stronghold during Bulgarian tsar Samuil's wars against the Byzantine Empire in the 11th century, when it was governed by the local noble Krakra of Pernik, withstanding Byzantine sieges a number of times. From 1396 until 1878 the city was under Ottoman rule. In the 20th century Pernik developed rapidly as a centre for coal mining and heavy industry. During the Communist rule of Bulgaria it was called Dimitrovo between 1949 and 1962 after Bulgarian Communist leader Georgi Dimitrov. The Surva International Festival of the Masquerade Games is held in the city every January. Surva is International Kukeri Festival in Pernik, Bulgaria. One of the biggest masquerade festival on the Balkans and Eastern Europe. Conducted in the last three days of January. Economically Pernik is industrial town. Industry is of vital importance for the economy of the province. Pernik is the major manufacturing centre, one of the largest in the country with the Stomana steel complex; heavy machinery (mining and industrial equipment); brown coals, building materials and textiles being the most important. Near Pernik there is an enormous plant for heavy machinery in smaller town Radomir which produces excavators and industrial equipment, but is currently not working at full capacity. 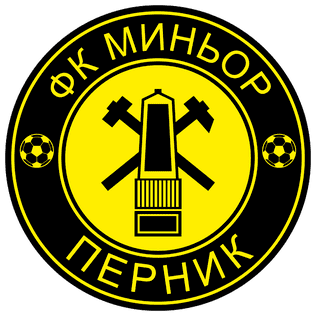 Pernik has two football teams, PFC Minyor Pernik and FC Metalurg Pernik. The name Pernik is thought to have originated from that of Slavic god of thunder and lightning Perun or from a local boyar named Perin + the Slavic placename suffix –nik (or –ik) added, and was first mentioned in the 9th century. Pernik is the second largest town in western Bulgaria. The town is located in the Pernik Valley at an altitude between 700 and 850 metres (2,297 and 2,789 feet), length of 22 kilometres (14 miles) and is surrounded by mountains Vitosha, Lyulin and Golo Bardo. Through the city flows the river Struma, which rises from Cherni Vrah – one of the largest rivers in the country with a total length of 290 km (180 mi). The total area is 28,863 acres (11,680 ha). Pernik is situated 30 kilometres (19 miles) southwest of the Bulgarian capital, Sofia. The territory of the town has many major roads, including Pan-European Corridor VIII and Pan-European Corridor IV – European route E79 /with Struma motorway and Lyulin motorway/, which connects Central Europe and Greece. Pernik has five railway stations and railway stops. The town lies close to one of the oldest trade routes in the Balkans, which ran from Sofia to Dubrovnik, via Skopje, Pristina, Sarajevo and Mostar. Pernik is a successor of the medieval town of Krakra. In the 4th century the Thracians built a fortress there. There is a rich collection of archaeological findings that evidence the existence of a Thracian settlement in the late Neolithic. The richest collection of pottery in the Central Balkans dates from that time. It is kept in the Historical Museum. The ancient Greek historian Thucydides wrote that in the theritory of Pernik lives Thracian tribe of Agrianes. The author mentions them in describing tells about the march of the Odrysaean King Sitalces against Macedonia in 429 BC. Other Thracian tribes in the area were graeite and ileitis. Their main city is called Adeva (Adeβa), on whose ruins was built Pernik. A wonderful exhibition of reliefs and sculptures is kept there, dedicated to the health-giving gods Asclepius and Hygieia, held in reverence in this region because of the presence of mineral springs. Bulgarians took advantage of the fortified spot and built one of the mightiest Bulgarian strongholds — Pernik. At the beginning of the 11th century the settlement was a fortress, impenetrable to the Byzantines. It was the seat of the legendary governor Krakra of Pernik, who played an important role in the time of the First Bulgarian Empire. In 1004, he bravely defended their fortress and several times stop the offensive of the Byzantine Emperor Basil II (popularly known as the Bulgar-slayer) to Serdika. After long fighting, Krakra caused severe damage to the Byzantine army and forced them to withdraw from his area. In 1016 Basil II again try to attack Pernik. After 88-day siege and numerous losses Byzantine Emperor was forced to withdraw. The legend remains that the blood from the Byzantine warriors was so much, that the rocks at the foot of the fortress of Pernik become red. From there came the name of the place around – Bloody. In 1017 Krakra gathered a great army combined Pechenegs. Both army forces were preparing to strike at Byzantium to liberate the lands between the Danube and the Stara Planina from Byzantine invaders. The politics of Constantinople bribe Pechenegs and they break up the union with Bulgarians. After the death of Tsar Ivan Vladislav in 1018, who left no apparent heirs to the throne, Krakra successfully negotiated with the Byzantines that the Bulgarians keep their internal independence in the newly formed theme Bulgaria. All Bulgarian nobility remained untouched and Bulgarian forces fully armed. The head of the Bulgarian church also remained Bulgarian. Today Pernik Fortress is one of the largest historic landmarks. In the time of the Ottoman occupation Pernik lost its significance as a fortress because it was located deep in the interior. In the city had not settled any other ethnic groups, except Bulgarians and the population lives relatively calm in recent centuries. Until after the Liberation of Bulgaria Pernik was a small stockbreeding village, consisting of several scattered hamlets. The beginning of Pernik's modern history is set in the 20th century with the development of the rich coal-beds of the region. According to some scientists, the existence of coal was already known in the 10th and 11th centuries. Before their industrial exploitation started, the local people dug it up with picks and shovels and transported coal with carts and wheelbarrows. Pernik's rapid development is associated with the large shipments of coal to the capital city, intended for household needs and for the railroad transport. Until then, coal for the railroads and the river and sea steamboats was delivered from as far as Cardiff in the United Kingdom. As the first miners' quarters were built on the terraces of the Struma River, the beginning of the miners' settlement of Pernik was set, one kilometre (0.62 miles) to the east of the village of the same name. It is a town since 1929, and since 1958 — a regional centre. The coal output reached its apogee at that time. Pernik has been an energy centre of Bulgaria for a few decades. There is not very large concentration of Gypsies within the city limits as the Gypsies are 1,709 in the city and 1,781 in the municipality, while the Bulgarians are 73,063 in the city and 88,831 in the municipality. The Eastern Orthodox Christian is the predominant religion. Pernik is in moderate-continental climate zone. Climatic conditions are influenced by the relatively high altitude – 750 m, but also by the fact that Pernik is in between mountains, which creates a specific micro-climate. Spring comes relatively late – in late March and early April. The average spring temperature is 10 °C (50 °F). Summer seasonal average temperature is about 22 °C (72 °F). The hottest month is July – an average monthly temperature 22.5 °C (73 °F). The absolute maximum temperature is 38.2 °C (101 °F). Autumn is warmer than spring, with seasonal average temperature of 11.2 °C (52 °F). Palace of Culture – Pernik – urban theater halls, orchestras, library, ensembles for folk songs and dances and more. Duhlata cave – the longest in Bulgaria. Duhlata – with input from the southern slopes of Vitosha Mountain is the longest cave in Bulgaria (17,600 m.) and deep 53 meters. A complex multi labyrinth system located on 6 floors. Necropolis archaeological Thracian tribe Agrianes from 8th to 4th centuries BC – about 20 km south of Pernik to Struma motorway near the village of Dren. Necropolis was discovered in early 2012 during the excavation of the highway. Unique necropolis discovered in archaeological finds of gold Thracian treasure from breastplates, earrings, hairpins, jewelry and articles of silver and amber, which are stored in the Historical Museum of Pernik. Thracian sanctuary is included in the ranking "The Wonders of Bulgaria" 2013. Mountain Golo Bardo, immediately above city Pernik. Golo Bardo separating Pernik and Radomir valleys, in which the nature reserve "Ostritsa". Holy water area – karst spring "Living Water" is near Vitosha village Bosnek. From his fountain of happiness, according to tradition of the 17th century, drank only the righteous, "but sinners refused." Nature Reserve "Ostritsa" is located on the slopes of Mount Ostritza in Golo Bardo Mountain. It is among the oldest protected areas in Bulgaria. "Nightingale" hut in Golo Bardo, just above the city. Sacred pit of Garlo – is an archaeological site located near the village of Garlo in Pernik District. Lyulin Mountain to the north of Pernik. Come on the road to the villages Divotino and Liulin. Mountainside is located Divotinski Monastery "Holy Trinity". Church "St. George" – str. "Cherkovna", district "Stoneware"
Church "St. Prophet Elijah" – neighborhood "Moshino"
Church "Saint Nicholas" – neighborhood "Church"
Monastery "St. Petka" – neighborhood "Kalkas"
Botyo Tachkov, US, German and Columbia university professor, president of a Wall Street investemnt bank, worker in the US Department of State, the United Nations and the World Bank, writer, awarded with Eleonore Roosevelt and Fulbright prizes. Romel Ivanov, athlete, national champion 1500 and 800 m.
Kiril Ivkov – football player, two-time the best Bulgarian player of the year, silver Olympic medalist from 1968. Pavel Vladimirov – football player, striker. Bronze medalist at the Olympics in 1956. Longtime captain of the "Minyor Pernik", finalist for the national cup in 1958 with "Minyor Pernik". Topscorer of group "A" in 1956 with 16 goals scored. Penka Metodieva – ex national basketball player – Olympic vice-champion at the 1980 – Moskow and bronze medal winner at the 1976 – Montreal. Evladiya Slavcheva – ex national basketball player – Olympic vice-champion at the 1980 – Moskow. 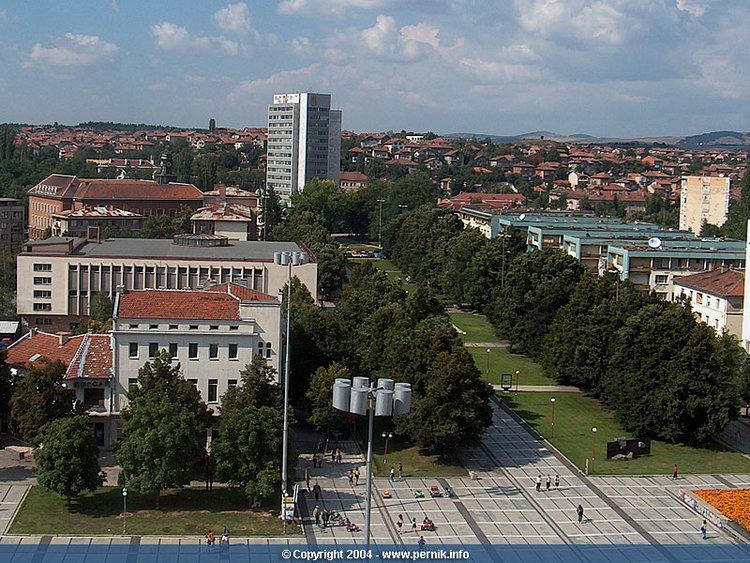 The first Bulgarian private technical university was established in 2010 in Pernik. The university was founded in close cooperation with nationally established industry partners. The European Polytechnical University offers Bachelor, Masters and PhD degrees in architecture, engineering and entrepreneurship among others. The university is aiming internationally and offers all courses bilingually in Bulgarian and English languages. Now the city operate 11 elementary schools and 14 High School – High School for learning foreign languages, Economy high school, Mathematics High School, school sports and other. – International Kukeri Festival in Pernik, Bulgaria. One of the biggest masquerade festival on the Balkans and Eastern Europe. Conducted in the last three days of January. Kukeri or Surva Festival (Mummer's games) in the town of Pernik, is the most spectacular "Kukeri" event in Bulgaria. At the end of January thousands of "kukeri" participants from different regions of Bulgaria, as well as from all around the world gather in Pernik for the three-day event. Kukeri is a pagan Bulgarian tradition of Thracian origins – in ancient times the old Thracians held the Kukeri (Mummers’) Ritual Games in honour of god Dionysus. The Kukeri games are performed by men only, dressed in colourful hand-made costumes and wearing scary masks. Each has also a leather belt around the waist with huge copper bells (chanove) attached to it. The Kuker's masks are decorated with threads, ribbons, laces and usually represent animals like goats, bulls, rams, or even chicken. Some of the masks are double-faced. On one of the sides, the nose is snubbed and the face is good-humored, on the other side, the nose is hooked and the face is ominous. Those masks symbolize the good and the bad which co-exist in the world. A very important thing for the symbolic meaning of the masks are the decoration colors. Red is the most used color – symbolizes fertility of the reviving nature, the sun and the fire; the black color represents Mother Earth and white is a symbol of water and light. The Kukers walk around, jump and dance special magic dances to scare away the evil spirits, to celebrate the beginning of the spring and hopes for a good harvest, health, land fertility, and happiness. The festival held in Pernik is the oldest festival of the masquerade games in Bulgaria. The first edition was opened on January 16, 1966. In 1995 the International Federation of Carnival Cities accepted the town of Pernik as its full member. In 2009 Pernik was proclaimed as the European capital of Surva`s and Mummer's. The news that the Kukeri tradition and the Surva Festival in Pernik will be included in UNESCO’s list of protected non-material cultural heritage, was announced before the inaugural ceremony of the 20th edition of the mummery fest. Characteristic of the region is the folkloric dance – "Graovsko horo" and folk clothes – female costumes "Litatsi" /Women are bordered with black litatsi paieti white shirts with belts/. Over the last decade Pernik is extremely famous in Bulgaria. Mass culture and the popular media often interpret events and people of the city. There are many jokes, movies, literature, TV shows and songs in which the main subject is a citizen of Pernik. According to them, a typical man from Pernik is always ready to get into a fight, speeds with his car, and talks with a specific dialect. His distinguishing features are: The miner's hat with a flashlight, T-shirts of the local football team “Minyor” and miner bracket in the hand. Bluepoint – factory for Swim and Beachware. Silcotech Bulgaria Ltd – Pernik – benefits from Swiss management and is part of the multinational Silcotech Group – specialized in two-component liquid silicon and engineering (technical) plastics molding. Puratos Pernik, Belgium company – Food, Food products, Bread, Bacery products. "Welding Machines" – is the successor of the former factory welding machines "Krakra" based Pernik. The production program of the company covers more than 25 welding products – welding transformers, welding rectifiers, Argon- arc welding, Burners and burners mini kit, Oxygen cutting torches and Set burners and oxygen cutting torch. Several companies declared bankruptcy after failure Privatization are: glass factories – "Crystal", for building panels DF "Concrete" /Beton/, for steel profiles "Blagoj Popov" /"Kamet"/ SA, for the production of pectin – "Pectin" AD, first Bulgarian machine-building plant "Struma", the older thermal power plant "TPP – Pernik." and other companies. Because of this, the city has a lot of empty factory buildings and infrastructure areas. a shopping mall is being built to host famous and international brands. city beach with an outdoor swimming pool in the central city park. 7th to 11th centuries – Pernik is economic, military and cultural center in the southwestern Bulgarian lands. Pernik town joined the First Bulgarian Empire in 816. The fame of city is associated mostly with boyar Krakra Pernik, who had determined resistance of the Byzantines in the beginning of the 11th century. 10th century – Saint John of Rila "...went to Pernik and settle down in stony place near the river called Struma". In the end of the 12th century the fortress of Krakra was destroyed, but the village still exists. 19th to 20th centuries – from agricultural region Pernik town became an important center of mining, metallurgy and engineering. 1891 – Opening of the first "State Mine- Pernik" . 1893 – Opening of the railway line Sofia-Pernik gives new opportunities to the village of Pernik. The railway station was built in 1927. 1895 – First bulb in Bulgaria lights up in Pernik. 1899 – The first power plant in Bulgaria is built in Pernik. 1903 – Announcement of St. Ivan Rilski the patron saint of miners and town of Pernik. 1906 – The First mass strike in Bulgaria. Strikers rising require an 8-hour workday, the right of association of miners in the syndicate and regular payment of wages. The strike ends with victory for the workers – their wages are increased. 1919 – Second Strike of Pernik mine workers. 7000 miners suspended from work. In the very next day management of the "Mine Pernik" sign a protocol, which obliged them to pay wages for the last two months and to pay regular wages of the workers in the future. 1932 The building of the Mining Department is complеted. 1944 – Third Strike of Pernik workers. In front of building of Mining Department thousands of workers organized a rally that quickly turns into anti-government demonstration. In clashes with police were killed 6 workers, 13 are injured. On 09.09.1944 the Government falls. 1953 – Opening of dam "Studena". 1953 – Completed the Post Office in the center of Pernik. 1957 – Opening of the City Palace complex of culture. 1966– The first officially conducting of the International Festival “Surva”. 1968 – Construction of a city department store, GUM. 1972 – Completed Hotel "Struma". 1978 – Completed the building of the Municipality. 1982 – Created today's center area of Pernik. 2010 – European Polytechnical University is open for the first time in Pernik. 2012 May 22 – The 5.6 Mw Pernik earthquake shook the provincial center with a maximum Mercalli intensity of VI (Strong), causing one indirect fatality. Pernik Peninsula in Graham Land, Antarctica is named after the city of Pernik.